I wanted to share a little insight on what goes into the decision-making process on determining when to close and not to close school for weather related issues. 1. Superintendents are not meteorologists (at least I am not). 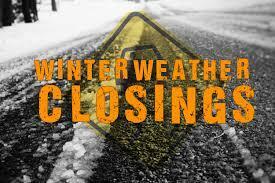 There is no college course regarding when and how to close school due to weather issues. We all try to balance the safety of our students and our staff with the reality of what the weather is actually doing or going to do. 2. Notice the day before is AWESOME - but it is hard do all of the time. The weather changes in this part of Illinois every five minutes. Last night, the forecast for today was for much lower temps and windchill readings than what actually occurred. So, by waiting to decide until morning, we were able to avoid a day off when we could be at school. We have all cancelled one time or another where by the time a school day starts......the weather is perfectly safe for school. 3. We all try to err on the side of caution. 4. In my case, during a weather event or forecast for a weather event the following takes place almost hourly: 1) Contact with area superintendents 2) Contact with transportation director 3) Driving the district routes to assess clear passage 4) checking the forecast on the weather sites that I have had the best luck with over time. 5. When a determination cannot be made in the evening, 4:30 AM comes early for temperature and wind monitoring and/or driving snowy/icy roads to determine safe passage or not. Yes, I actually get out and drive the roads early, along with other members of our team. 6. Other factors include: 1) providing two hot meals to our students 2) staff traveling from areas that may have been harder hit with snow and ice 3) extracurricular events 4) will our buses start and/stay running 5) will our walkers be properly clothed for low temps and high winds 6) childcare concerns for our parents who work.....and on and on and on. For the most up-to-date information regarding school closings - download our smartphone app (A-Town 276) and allow notifications from the district. Our app users will know sooner because the call and email take extra time to login, create, and send out than the live feed and notification settings. Also our district Facebook page and Twitter account (@Dist276Atown) provide quick access to closings and all other things A-Town related. In conclusion, there is no magic formula for determining when to cancel school. All I, and other area superintendents, can do is try to base the decision on the safety of our students and staff.